You know the Briggs story, indigenous kid from regional Australia (Victoria). if not, let me refresh your memory, from the moment Briggs dropped his self-released debut EP, the brilliant and ground breaking Homemade Bombs (2009), it was obvious to everyone that this marked the arrival of a powerful and unique voice on the scene. His indigenous roots and his rural upbringing in the small country town of Shepparton (Victoria) gave him a perspective like no one else. Powered by a rapid-fire, melodic, direct approach, Briggs was as funny as he was deep. It was this rare combination of characteristics that lead to him being embraced by some of the wiser and more experienced heads in the local scene. The newcomer was invited to open for the likes of Adelaide’s Funkoars and Perth’s Drapht. All this paved the way for the release of his debut album, The Blacklist. While Homemade Bombs gave us a taste of what he can do, The Blacklist was nothing short of brilliance. A genuinely unique symphony of words, thoughts and sounds. Briggs toured tirelessly around the country with Hilltop Hoods, solo and supporting international tours with the likes of Ice Cube, Yelawolf, Doom, Ghostface Killah and Pharoahe Monch. Then it went quiet. He had a kid and seemed disillusioned not only with hip-hop but with music. We often hear of the “Difficult Second Album”, the theory is that an artist has had his whole life to make the first album and about 12 months to make the second. As with most labels this does not apply to Briggs. After time to reflect he went back to writing and recording. 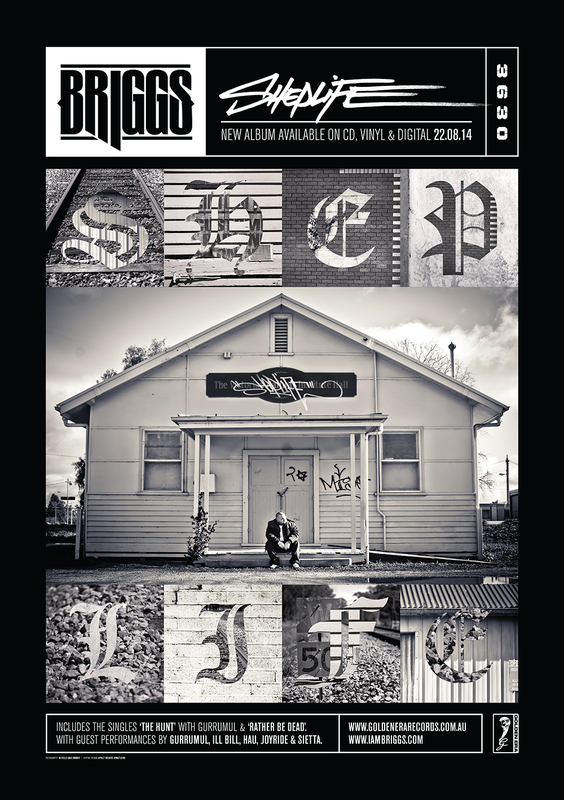 With appearances from Ill Bill, Joyride, Sietta and Geoffrey Gurrumul Yunupingu Sheplife is the album by which Briggs will compared to for his whole career and he likes that, the good ones always thrive on pressure.